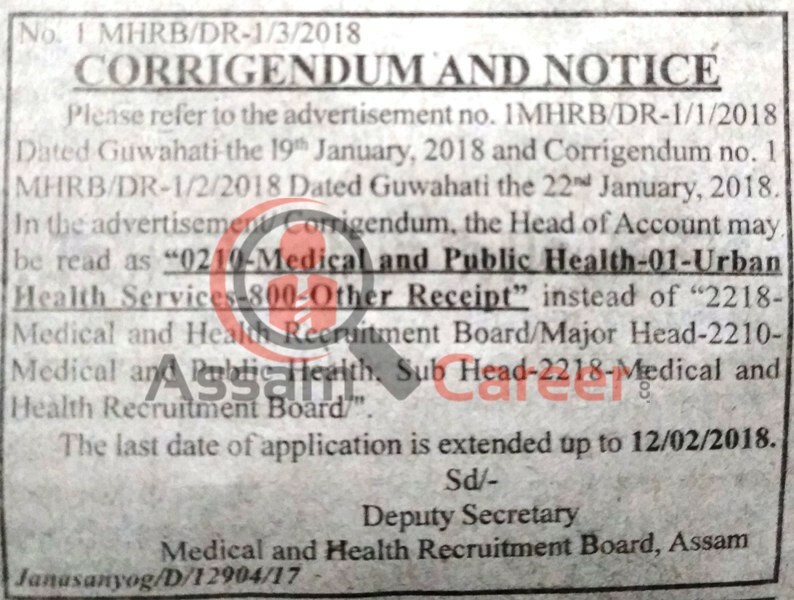 Medical and Health Recruitment Board, Assam invites application from Indian Citizens as defined in Articles 5 to 8 of the Constitution of India for the under-mentioned posts under Assam Government in the scale of pay as indicated below and carrying usual allowances as admissible under Rules of the Govt. of Assam. Age: A candidate should not be less than 18 years and not more than 43 years as on 01/01/2018 as per Personnel (B) Department’s Office Memorandum No. ABP.06/2016/04 Dated 03/03/2016 with corrigendum No. ABP/06/2016/07 Dated 26/09/2016. i. Application must be accompanied with required application fee of Rs. 250/- (rupees two hundred fifty) only for General category candidates and Rs. 150/- for SC/ST/OBC/MOBC candidate. ii. Candidate having BPL certificate: Nil. Application fee should be deposited only through Treasury Challan in the Head of Account “0210-Medical and Public Health-01-Urban Health Services-800-Other Receipt". How to apply: The name of the post applied for should be clearly written in “bold letters” in the Envelope containing the application form prescribed in Assam Gazette Part-IX and it should be addressed to the Chairman, Medical and Health Recruitment Board, Assam, National Health Mission, Saikia Commercial Complex, Christian Basti, Guwahati-781005.